Paradoxical phase, when weak stimuli get strong responses…. When did it happen? A certain early stage of sleep: you had not heard the Mosquitoes and Lancasters tonight on route to Germany, their engines battering apart the sky, shaking and ripping it, for a full hour, a few puffs of winter cloud drifting below the steel-riveted underside of the night, vibrating with the constancy, the terror, of so many bombers outward bound. Your own form immobile, mouth-breathing, alone face-up on the narrow cot next to the wall so pictureless, chartless, mapless: so habitually Hank… .Your feet pointed toward a high slit window at the far end of the room. Starlight, the steady sound of the bombers’ departure, icy air seeping in. The table littered with broken-spined books, scribbled columns headed Time / Stimulus / Secretion (30 sec) / Remarks, teacups, saucers, pencils, pens. You slept, you dreamed: thousands of feet above your face the steel bombers passed, wave after wave. 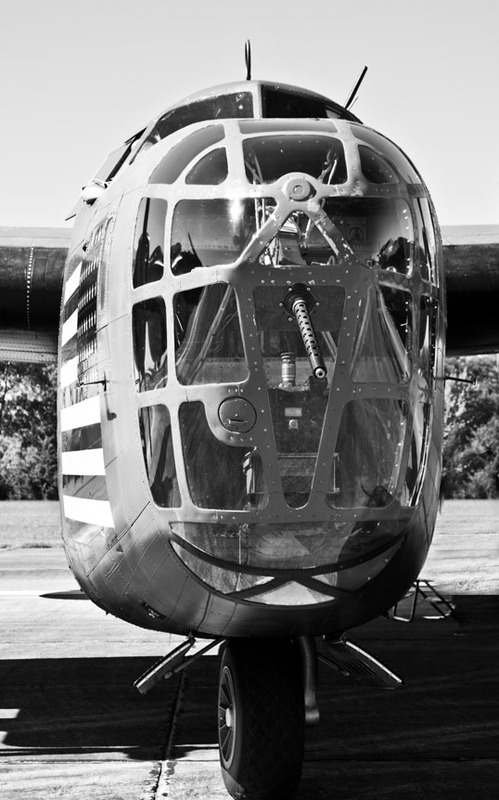 This entry was posted in Photography and tagged aircraft, b&w, b-24, black and white, bomber, commemorative air force, Dallas, diamond lil, liberator, photograph, Photography, Texas, vintage, wwii. Bookmark the permalink.